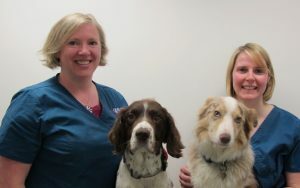 We are a modern friendly independent veterinary practice. Our aim is to give you and your pet the best treatment options available at an affordable cost in a relaxed and friendly environment. Our premises are modern and clean, we have all the most up to date equipment and expertise needed to use it, and our staff all genuinely love animals. Whether you have a poorly kitten, a lame dog, a bald chicken or a sneezing tortoise, we will do our best to sort them out. Even if you just have a question about feeding or exercise, give us a call and we can give you whatever advice you need. We are especially excited about our new rehabilitation and hydrotherapy suite which allows us to offer many treatments, including underwater treadmill (below). This facility allows us to improve treatment options to a wide range of animals, from the older arthritic dog (and cat) to those recovering from surgery. Have a wander through our website, look at what we do and see if you will love our surgery as much as we do.